Were you able to successfully save yourself from holiday debt? If not, well, you are not alone. A lot of Americans have accumulated a lot of debt after the season. According to an article published on CheatSheet.com, overspending is something that Americans are used to doing. In fact, the article goes as far as to say that it has become a holiday tradition. Based on the survey done by Sun Trust Banks, 46% of American consumers are pressured to spend more than they can afford during this season. That means they are willing to be in debt to give themselves and their families the holiday celebration that they think they deserve. Apparently, a lot of American consumers are willing to spend a lot of money during the holiday season. They are feeling more confident about their finances that they can gamble their money to buy more expensive items. If you were among the confident consumers last holiday season, you must have been spending a lot of money just to make the festivities a fun one for you and your family. There is nothing wrong with your intentions to make your family happy. But if it involves holiday debt, then you need to think twice before you spend more. You may have ended the year with a bang but try not to start the year with financial problems. If you are already in debt after the holiday season, that is okay. Move on and aim for a better spending behavior. But for now, let us work on the debt that you already incurred. After all of the festivities, we are now back to reality. As the first month of the new year draws to a close, we are now faced with the billing statements that reflect our spending during the holidays. According to an article published on WashingtonPost.com, the overall spending for the 2015 holiday season is $626.14 billion. This is according to the data gathered by the National Retail Federation. While this is lowered than the expected sales of the organization, it is still a 3% increase from the previous year. The article did not indicate how much of the sales came from credit spending. But one thing is for sure – there is no doubt that people are now more financially confident. They are no longer afraid to spend their money even if it will lead them in debt. While you may have incurred some holiday debt, that does mean it should stay. You have to work hard to get rid of that as soon as you can. The earlier you accomplish this, the more money you can use from your budget to improve your finances this year. So what can you do with the debt you accumulated at the end of 2015? Here are the steps that you need to take. Survey the damage. Start by finding out how much debt you owe. If you have previous debts, put that aside first. Concentrate on the debt that you got during the holiday season. If you used more than one credit card, make sure you create one file that will reflect all of the debt you incurred. Once you have the total, look at the minimum payment requirement that you need to contribute each month. Analyze your budget. After organizing your debt information, it is time to look at your budget. Look at your income and your current expenses. Take special note of your existing debt obligations. Combine your holiday debt with your existing ones. Create one file and calculate the minimum payment requirement of all your debts. See if your income can cover your usual expenses and the new debt amount that you owe. Find the funds. The next thing that you have to look into is finding the funds that will allow you to pay off your debt. This will be harder if your income cannot cover the minimum payments that your debts will require each month. You may have to get another job or a side gig in order to meet all your credit obligations. You can also choose to lower your spending so you can free up the funds to send towards your debt payments. Adjust your financial goals. The next step is to revise your financial goals. If you are planning to save up for a vacation this year, you may have to rethink this target if it makes paying off your holiday debt difficult. 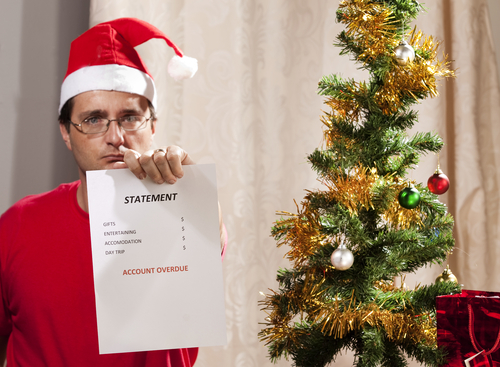 You need to make some sacrifices if you want to solve your holiday financial hangover. Plan for next year’s holiday spending. This may seem too early but if you think about it, there is wisdom in being prepared. The earlier you start preparations, the less of a burden it becomes. It does not have to be anything grand. You can start by setting a budget for your holiday spending and save up for it. That way, your finances will be ready for the heavy-spending that the next holiday will bring. You do not have to be worried about how you can stay out of holiday debt. Since you are working hard to solve the credit incurred during the holidays, you should probably think about the rest of your debt obligations. If you are motivated to improve your finances, you need to seriously find a debt solution that will lower your balance significantly this year. Once you have gotten rid of your debts, you can now concentrate on growing your personal net worth. Take for instance credit card debt. According to an article from CNN.com, American consumers ended 2015 with over $900 billion worth of credit card debt. While it is unclear how much of these were spent during the holidays, it is clear that the country has a lot of debt to pay off. The report from CardHub should serve as a wake-up call for all of us. You do not want to be caught in another financial crisis just because we allowed our credit card debt to reach great heights again. You need to make a commitment to manage your debt this year. To do that, here are a couple of tips that can probably work for you. Borrow only what is necessary. Always borrow only what you need. If you only need a 3-bedroom home to house your family, do not borrow a home loan that will allow you to buy a 5-bedroom property. This is true even if you can get approval for it. Sometimes, bigger is not always better. Plan your credit use. If you have to borrow money, make sure you approach it with a plan. Understand the purpose of this debt. How much can you afford to borrow without compromising your current lifestyle? How will you pay off this debt while paying for all the other expenses that you have? Do you have a debt payment plan in place? Make sure you make smart debt decisions by understanding your current financial position. Monitor your credit score. Finally, you want to make sure that you are monitoring your credit score. The Federal Reserve mentioned that they intend to raise the interest benchmark this year. That means the financial institutions will follow and raise their own rates. If you have a good credit score, you can be qualified to get the lowest rates that the financial industry can offer. To maintain a good score means you have to monitor it. Your holiday debt may be like a financial hangover but it does not have to stay for long. If you are committed enough to work on your debt situation, you can be in full control of your finances this year. This could be the year when you go through the biggest financial improvement in your life.